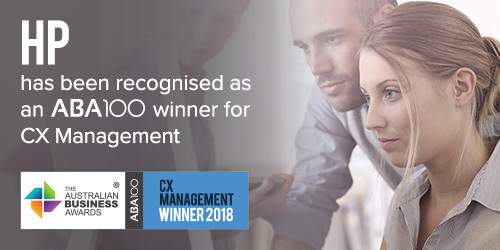 HP has been recognised as an ABA100 Winner for CX Management in The Australian Business Awards 2018. In 2015, HP South Pacific launched a new range of notebooks in the premium consumer category that lead with advanced technology and with new aesthetically pleasing design. A Project Team involving people in the local Australian office as well as regional people was formed to deliver a Differentiated Support Model for HP’s premium/gaming customers. HP created a Premium Phone Support Team within its call center. The chosen members of the team were highly experienced in facing customers owing to their long tenure and had a passion for our gaming platforms and were equally adept in customer service skills. The team also underwent enhanced training for technical troubleshooting. Once the upgraded support was in place by the end of 2016, the next step was to prepare onsite service in Australia and New Zealand. HP started with a selected number of premium products and changed their service delivery from only offering a ‘return to bench’ model to also including onsite support to the customer’s premises using our existing commercial onsite team in major city locations. Throughout 2017, HP expanded the premium products to include a broader range of models and added the ‘Omen’ gaming range. In late 2017, HP initiated the last phase of the change in support for premium by introducing a new team in the regional contact center that would concentrate on the overall end to end experience of the customer. The Total Case Management (TCO) Team would take ownership of the customer’s case if the issue was not resolved after an onsite visit. Before the introduction of the TCO Team, most of the detractors in our customer satisfaction survey were customers who had unresolved issues. It was identified that the root cause of these unresolved cases was premature closure. By introducing the TCO Team to our support process, the cases could be kept open until resolution. The team would also keep the customer informed at every step in their journey to get their issue resolved.